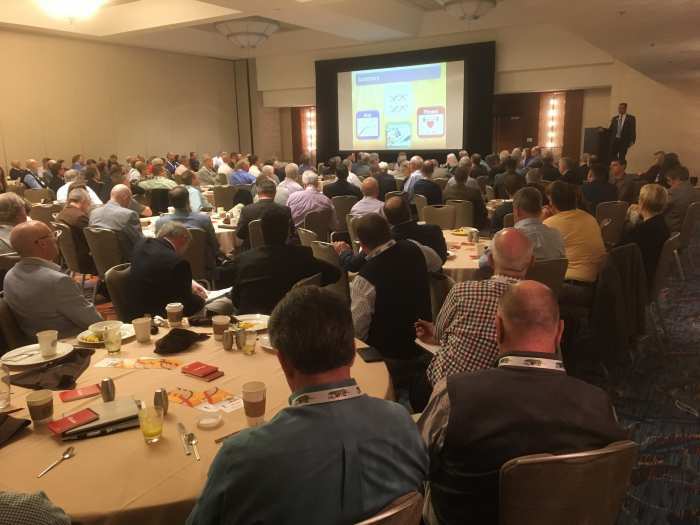 Aviagen Turkeys was once again pleased to kick off the National Turkey Federation Convention with a breakfast presentation. 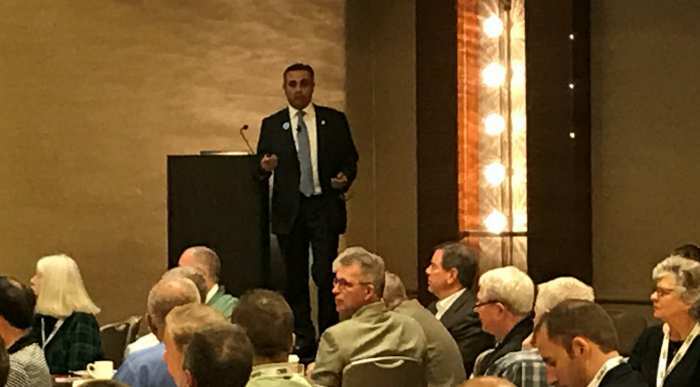 Over 250 industry leaders joined us to learn how we’re incorporating genomics to deliver a better bird. 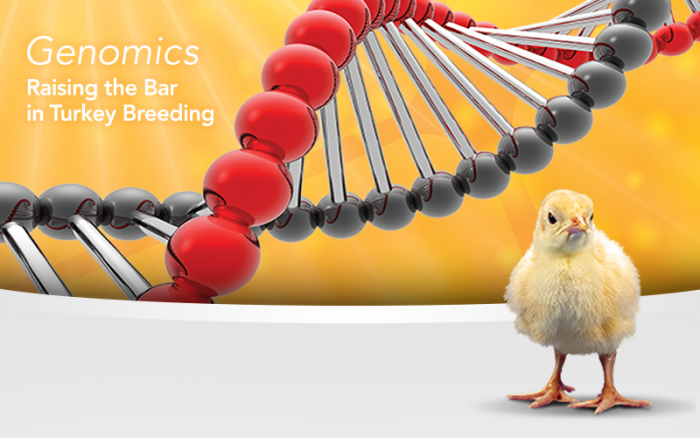 Since the mapping of the turkey genome in 2010, Aviagen has been working with scientists around the world to develop efficient methods to use genomics in its turkey breeding program. For the breakfast, Dr. Santiago Avendano, Aviagen’s Director of Global Genetics, and Paige Rohlf, Research and Development Manager for Aviagen Turkeys, created a video to explain genomics, how we are using it and some of the exciting results that we are already seeing in our pedigree populations. Aviagen has made tremendous improvements in bird performance by selecting its pedigree birds for Phenotype. The phenotype is the observed performance of the bird – how much weight they gain, how much feed they eat, how their bones are developing - these are examples of phenotype. The genotype is a prediction of performance based on the turkey’s genomic information. We make the prediction based on the DNA that they've inherited from their parents. Aviagen is proud to introduce polygenic selection to turkey breeding. Polygenic breeding values combine both selection for genotype and phenotype. Using both sets of information is the most accurate way for us to further improve our selection techniques and will allow us to deliver more genetic progress. Genomics also can give us the opportunity to select for traits that are difficult and sometimes impossible to measure. Breast meat yield is a trait that we have been able to improve, but finding a genetic link to meat yield will allow us to make even faster progress. Immune function and disease resistance are other areas where genomics holds tremendous promise. For many years we have used several techniques to select for improved livability. We evaluate leg development with an X-Ray and score the way the turkeys walk to ensure they have strong legs. We feed a vegetarian diet and do not use antibiotics or coccidiostats. We also use commercial stocking densities. These things have gained genetic progress, but that progress hasn’t been fully realized in the field. This could be because livability is difficult to select for in our pedigree farming environment. Pedigree facilities must be extremely biosecure in order to protect the breeding stock. This limits exposure to pathogens and other issues that could impact livability in a flock in a more commercial environment. Birds that do well on a pedigree farm might not do as well on a commercial farm. To address this issue, Aviagen’s chicken breeding company introduced multi-environment selection in 2000. They took the siblings of the pedigree birds and evaluated them in a typical commercial broiler environment. They found significant improvement in livability in the field and implemented a similar process at Aviagen Turkeys in the UK in 2011. Aviagen Turkeys has now started multi-environment selection in the U.S. The farm is in a poultry dense area of Virginia, which will still allow our West Virginia based selection team to evaluate the pedigree siblings and compare the results with the pedigree candidates. Based on the results seen in the UK, we should start to see the improvement in livability from these selections in commercial turkeys in 2021. Aviagen Turkeys is proud to be part of the Aviagen Group. The company is focused on developing and investing in the resources that will allow us to continue to provide better bird performance. By doing this we help our customers produce food with a smaller agricultural footprint for a more sustainable world.